Hand grenades play an important part in modern war as lightweight and hard-hitting infantry weapons. But their development hasn’t been a steady one, and for a while it looked like they would be abandoned entirely. Something approximating a hand grenade existed long before the handgun. Joints of bamboo filled with gunpowder were flung by the Chinese while warriors in Europe had yet to hear the roar of an explosion. When gunpowder reached Europe, the military of that continent proved adept at turning it to new designs. Cannons and simple handguns appeared in the 14th century, and grenades are recorded in the 15th century. 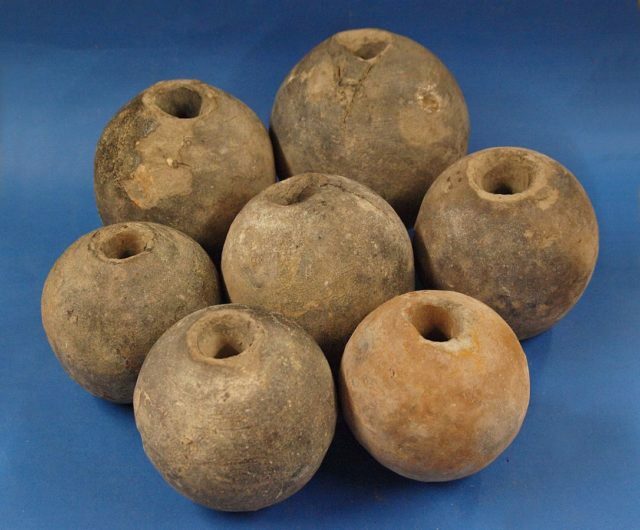 These were simple devices – iron spheres packed full of black powder with a hole in the top for the fuse. The fuse was lit, the device was thrown, and as long as the throw was good and the fuse kept burning then destruction could be caused amid the enemy. Grenades first played a significant role in the 17th century. They had become a little more sophisticated over the course of 200 years. The grenade was now filled with pistol balls as well as gunpowder so that the targets would be hit by flying projectiles as well as the blast of the explosion. This was where the device got its name, as the bullets loaded in the grenade looked to many people like seeds in a pomegranate, called a “grenade” in Middle French. War in 17th century Europe was largely based around static engagements in which armies tried to capture fortified strongpoints. Flung over walls or through windows, grenades could shock and devastate the troops inside, clearing the way for an assault. The problem with these early grenades was that they weighed three pounds. Throwing them any distance was difficult and so tall, strong men were chosen for this work, becoming grenadiers. Even they had to duck behind walls after flinging their grenades, to avoid being hit by the flying balls. In the 18th century, the grenade was almost abandoned. Bags of grenades were heavy and unwieldy to carry on the battlefield. A spark in the wrong place could set off a whole bag of grenades, killing the grenadier and many men around him. They could be made ineffective by weather and terrain – when the Duke of Marlborough sent grenadiers to assault a position outside Bouchain in 1710, their grenades got soaked crossing a river, making them useless for the attack. 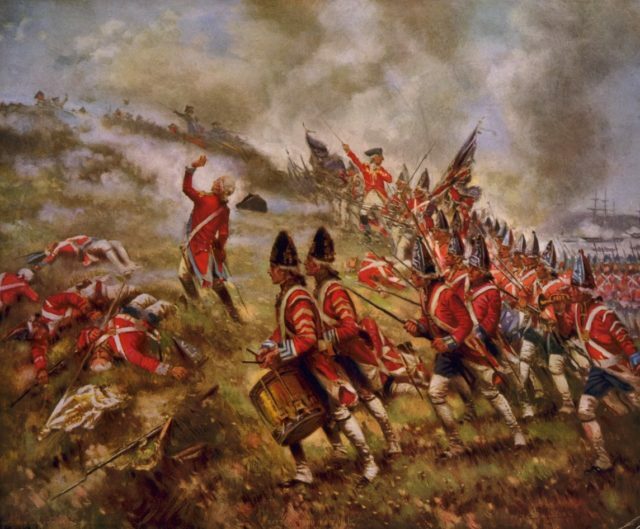 British grenadiers, distinguished by their miter caps, acting as assault troops at the Battle of Bunker Hill. However, in 1768 the miter cap pictured here had in fact been replaced within the British Army by a bearskin. 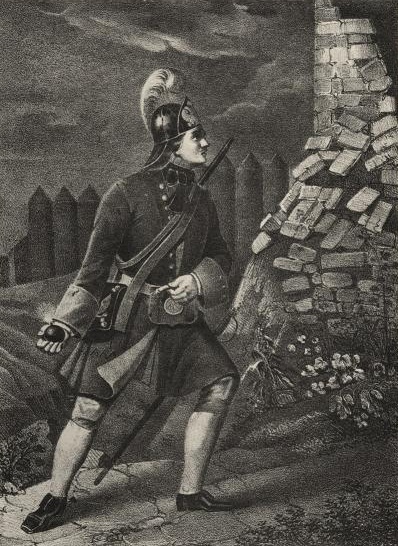 By then, grenadiers had become prestige troops. Tall, strong, and impressively uniformed, they stood out on the parade ground. Even without their grenades, they were hard hitters, an image reinforced by their place in Marlborough’s tactics of rapidly storming enemy positions. And so grenadiers remained even though they no longer carried grenades. 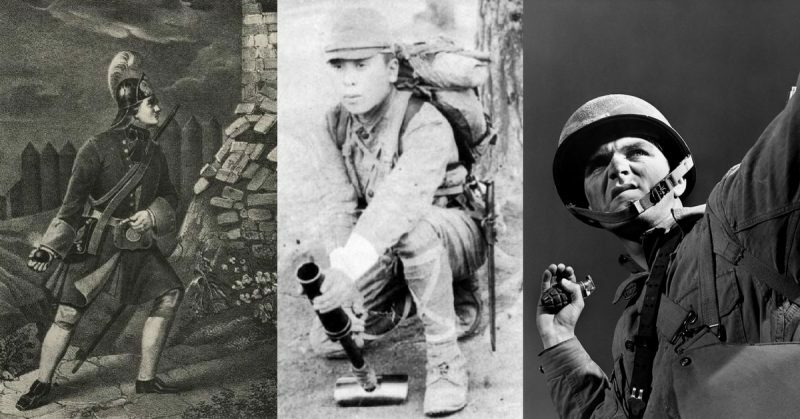 The grenade’s fortunes were revived by another period of static warfare – the Western Front of the First World War. Miles of trenches turned this campaign into the largest siege in history, as both sides tried to crack each other’s defensive lines. In these circumstances, grenades became incredibly useful. If a soldier could fling a grenade into the enemy trenches then he didn’t have to see them to hit them. So it was the men on the front line who began using grenades again, improvising them from old cans filled with explosives, scrap metal, and nails. The principle was the same as the early grenades, the execution cruder but just as effective. Governments caught on and started manufacturing grenades for their troops. The Germans took the lead with their iconic “potato masher” grenades, whose handle helped infantry to fling them further into the Allied lines. The modern grenade design was developed by the British in response to German grenades. Before World War One, a Belgian engineer had been working on a grenade with a lever that, when released, began the detonation process. He was captured by the Germans, but in January 1915 a friend mentioned his design William Mills, a British marine engineer and metallurgist. Mills took the concept of the Belgian grenade and redesigned it for the British army. At first, the new grenades were hazardous to use as the lever kept springing off. Mills added a pin that secured the lever in place and which could be removed with one hand. The lever would then fall away as the grenade was thrown, triggering the fuse. Five seconds later, this pineapple-shaped device exploded, blasting its targets and piercing them with fragments of metal. 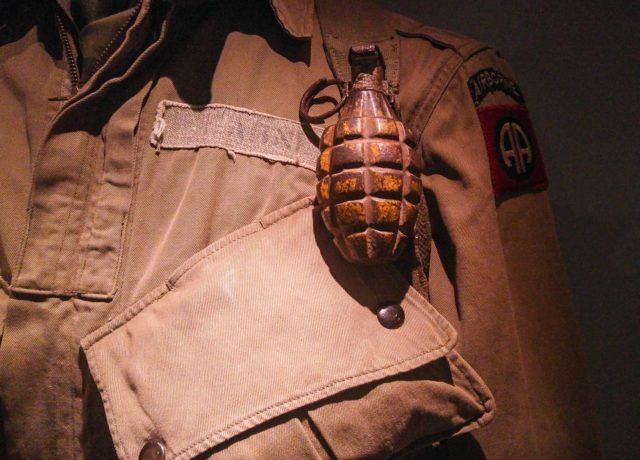 Deadly and easy to use, the Mills grenade brought Allied grenade technology ahead of that of the Germans. From the start, soldiers wanted ways to throw grenades further. From World War One onwards, this started becoming a reality with rifle-propelled grenades. The first rifle grenades used two different techniques to fire. Either the grenade was placed in a cup at the end of the rifle or it was attached to a rod thrust down the barrel of the gun. Either way, a blank cartridge was fired, the gas from the explosion propelling the grenade further that a man could throw it. 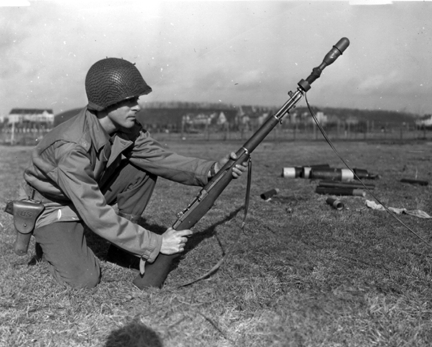 M7 grenade launcher with 22 mm grenade fitted on the end of an M1 Garand rifle. After the Second World War, grenades were developed with steel blocks in the bottom, allowing them to be launched using a regular cartridge. But the ultimate development of the rifle grenade came with grenade launchers, separate guns sometimes attached underneath infantry weapons and issued by both sides during the Cold War. 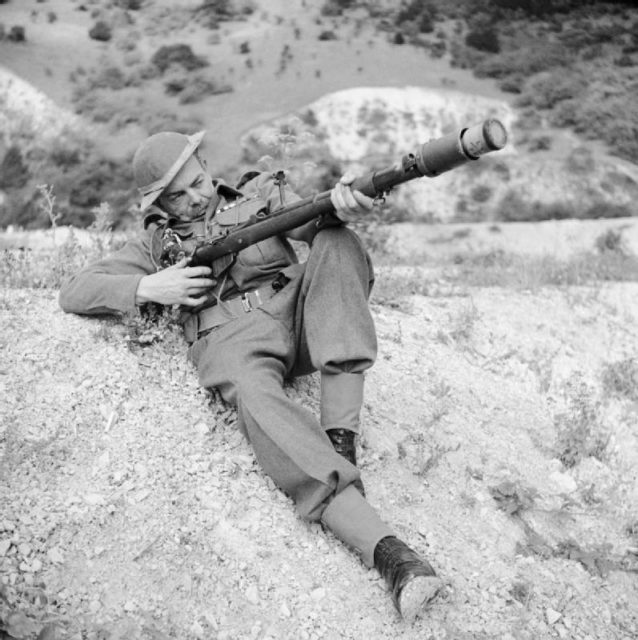 A member of the British Home Guard demonstrates a rifle equipped to fire an No. 68 anti-tank grenade. With the fundamentals of grenades fully developed, 20th-century engineers went on to create a range of specialist grenades. Defensive grenades were used from cover and sprayed fragments over a wide area to hinder assaults. Offensive grenades used concussion to take opponents out at short range. Anti-tank grenades delivered a focused explosion in one direction to pierce armor, and so needed fins or a tail to keep them pointing the right way. Grenades are no longer the unwieldy specialist weapons of old. They have become a flexible, varied tool any infantry can use.